You may not be a poodle person. I have been one all my life; ever since Pierre, the black royal standard lived next door. You may not be a poodle person but I have found that most people are either in denial, have had a bad poodle experience (it was most likely a bichon frise) or they are in the poodle closet. You may not be a poodle person but Mary Jane has a magic about her. Spend a bit of time with her and you may be a poodle person too. Copyright 2001. All Rights Reserved. No part of Poodle Haiku can be produced in any form; electronic or mechanical without permission in writing from the authors. 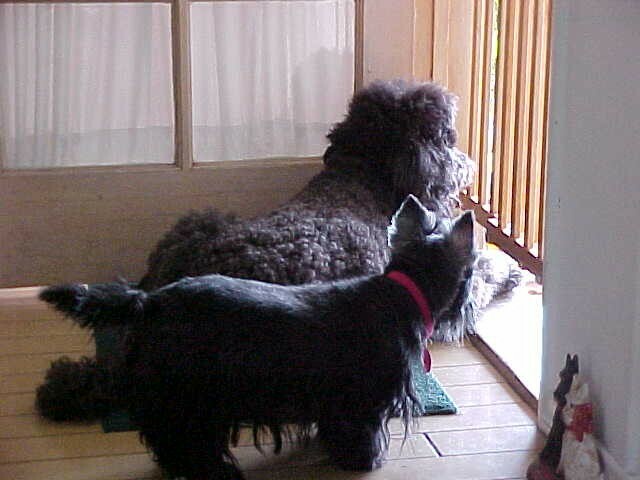 On watch all day long, We bark only at brown trucks. Don't know why. Do you?